VANCOUVER — The best race of John Gay’s life almost didn’t count. Yet when you listen the UBC Thunderbirds’ third-year middle-distance sensation talk about what it meant just to get to the starting line against some of the best steeplechasers in the world at the USA Track and Field Distance Classic last month in Los Angeles, his actual time seems almost immaterial. Of course that last part is not completely true. Not when you’re an under-recruited kid out of Kelowna’s Okanagan Mission Secondary, who in three seasons has risen from virtual obscurity to becoming one of the continent’s very best collegians. At the USTAF’s Distance Classic, Gay posted a huge personal best time of 8:36.55, some 38 seconds better than the personal best of 9:15 he owned just two seasons ago. And if you think it wasn’t impressive that he finished 10th in a field of 19, consider that the man who won the race, Kenyan native and U.S. Olympian Hillary Bor, ran the world’s fastest time this season (8:23.08), and that Bor and the next two finishers all qualified for August’s IAAF World Championships in London based on their performances. Yet it was well after the race when Gay learned that, on its second lap, the steeple barrier stationed in front of the water pit had been clipped by one of the competitors in such a way that its height fell from the standard 36-inch height to only 30 inches for one lap. On May 6, 12 days before his performance at the USTAF meet, Gay competed in the Oxy Invitational on the very same track at Occidental College, producing a then-personal best time of 8:43.20. To put that performance into perspective, it was at the time, the No. 1 performance this season in all of U.S. collegiate track. With UBC competing at the smaller NAIA level, however, it was the last blue-chip field Gay would be able to find before the end of the qualification period for his own national championships. 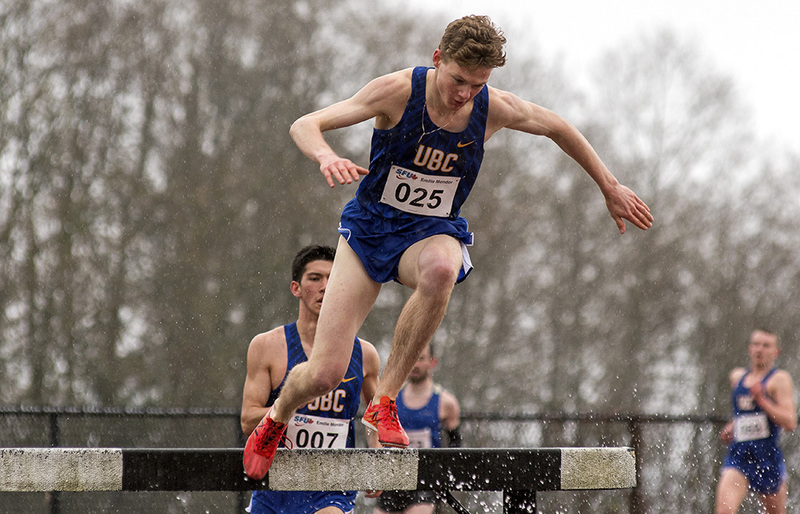 It bears mentioning that he went on to win the steeplechase for the second straight year as part of UBC’s historic men’s team title at the NAIA nationals on May 27th. Yet perhaps the most significant race Gay has run this year was the USTAF meet, and not solely because of the time he delivered. With qualification periods all closed and with Gay already having earned berths to both the NAIA nationals, Canadian nationals and the Francophone Games, UBC had absolutely no reason or responsibility to send Gay anywhere, other than for his own good. And so there was Gay, the kid who got no offers from anyone outside of UBC coming out of high school, prepping to run against some of the world’s very best. “You’re immersed in that atmosphere and so you have to choose to rise to the occasion,” began Gay. “I’m on the starting line and I recognize the guy I’m standing next to. He (Hillary Bor) finished sixth at the Olympics. Yet excuse him for some jitters which were near-comically manifested in his out-of-character decision to lead the pack for part of the race. 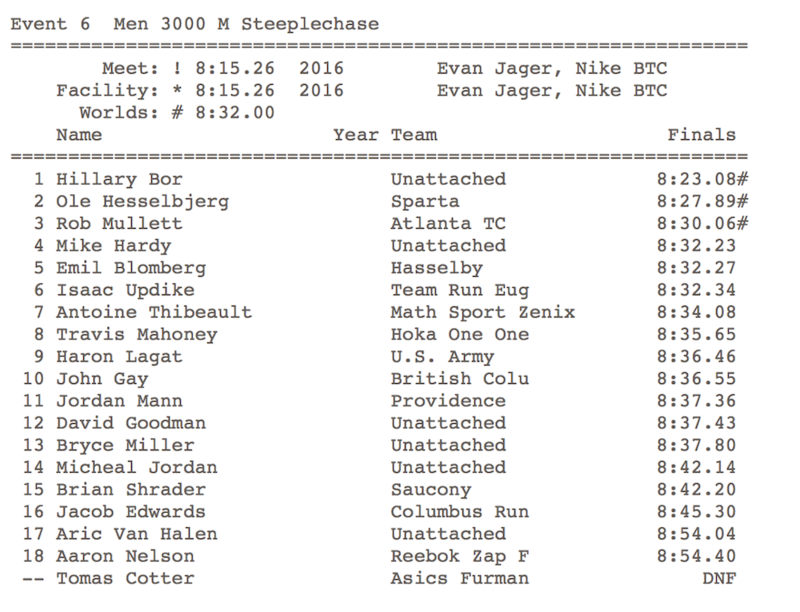 The results of USTAF Distance Festival’s 3,000m steeplechase. It’s like we said off the top, Gay’s actual time in the biggest race of his life was almost immaterial because the perspective it brought to his passion was literally priceless. UBC bought him his ticket, entered him in the meet, and then pointed him in the direction of the airport. But of course he was never really by himself because the school’s extended track and field family continues to compete in the sport at its top levels across North America. And watching local Olympians at every step has done nothing but help Gay gain a deeper understanding of every aspect of his sport. “Luckily for me there is such a strong post-collegiate community and several of them were flying down to compete in the meet,” says Gay, who wound up rooming with Luc Bruchet, the ex-Birds star and Rio Olympian. Of course, the time Gay spent with another Olympian pre-Rio, North Vancouver’s Chris Winter, the Oregon grad who trained here before competing in the steeplechase, was also huge. And it’s all led him towards a high-performance summer of ’17 in which he will compete in B.C.’s most tradition-laden invitational before embarking on national and international competition around the world. On Wednesday, Gay will run locally in the 3,000m at the Harry Jerome International meet. He then starts July by resuming his 3,000m steeplechase speciality at the Canadian Championships in Ottawa, and then finishes the month in Africa when the Ivory Coast plays host to the Francophone Games. He is hoping to take care of the business he needs to at nationals to maintain his standing to compete for his country a second time this summer at the FISU World University Games (Aug. 19-20) in Taipei. For one week following his 8:36.55 PB in Los Angeles, Gay wondered if his best-ever performance would be deemed official. In the end, the times stood, and thus Gay had a set a new bar of excellence to try to top as he continues his climb within the Canadian national program. 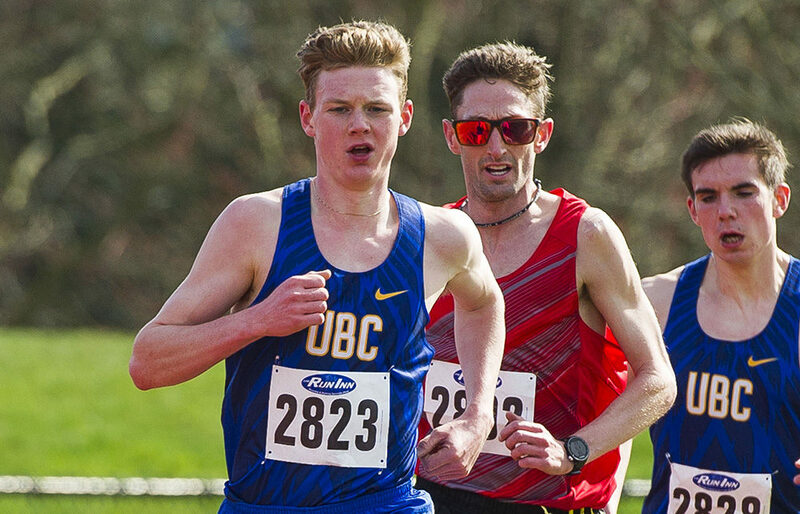 Although UBC never publicized its decision to send Gay to the USTAF meet, it fits a delivery system that ‘Birds head coach Laurier Primeau says has to come first. That, of course, is one of those things that doesn’t get talked about a lot. Yet couple it with things like rooming with Luc Bruchet, and standing at a starting line next to a guy like Hillary Bor, and it makes Gay’s ‘extra’ trip stateside seem essential, not optional. To think what can come from one plane ticket, from one selfless show of faith? It’s enough to make you realize that what really counts are things like the race which almost didn’t count.